Billings Boats BIL576 Bluenose Canadian Racing Schooner 1/65 scale wood ship kit! 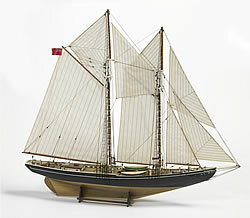 The schooner Bluenose has a very special place in the history of navigation and yachting. Built to fish off the Newfoundland coast, the ship soon turned out to be such a fast sailer that she won all the great classical regattas along the USA’s Eastern coast. She was built in Nova Scotia in 1921, and shipwrecked near Haiti in 1946. A true copy – Bluneose II – was launched in 1964.